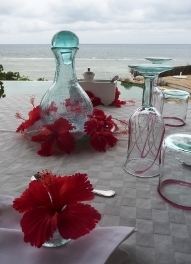 Msambweni Beach House & private Villas is one of these places best enjoyed with a 'Someone Special' and the perfect, ideal place for a Honeymoon, Valentine's Day Treat, Special Occasion of any sorts, or just like that! 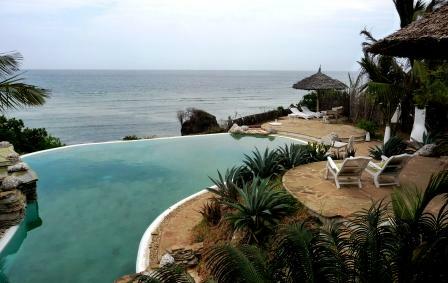 This little piece of heaven is located at the South Coast of Kenya, about 2 – 2.5 hr drive by car from Mombasa airport. 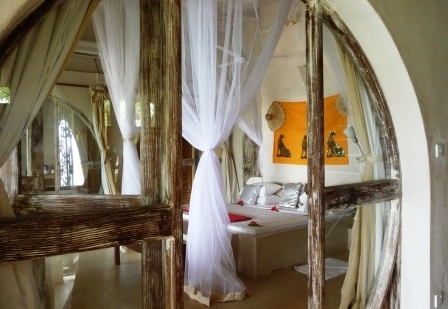 Tucked away; it gives a very secluded ambiance and offers pure bliss of complete quietness. The occasion in my case was to celebrate Valentine's Day. It is a safe thing to say that it will stay with me forever! Villa #1 was our home for the next 4 days/3 nights and it felt like stepping into another world, where nothing else mattered other than enjoying each others company, incredible food & drinks, being spoiled by the staff, jumping in the pool whenever, watching the tide come & go, and letting the mind wander. It took me about an hour to fully comprehend that I wasn't dreaming. 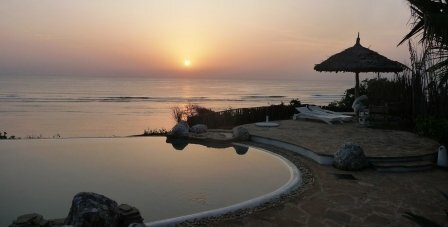 Having our own big infinity pool, the one's that seem to be going straight out into the ocean, a Jacuzzi, huge bedroom (with air-conditioning, if desired), big roomy bathroom, lounge area...oh, and did I mention, our very OWN pool overlooking the ocean?! After settling in we went for a little stroll down to the beach, where we found a lovely spa & massage area under the most amazing giant baobab tree, which we later learn is over 500 years old. Since the tide was in, we went for a little dip before wandering back to change and have a beer & Amarula at the Main house. We opted to have dinner at our new home (you can pick wherever you’d like to have breakfast, lunch & dinner. 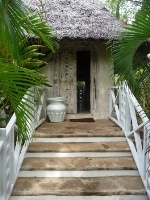 Either in the privacy of your place, by the Main house or by the pool. ); by the time we showered and got dressed, our little table was set up and dinner was ready to be served. The Owner/Managing Director Frederik Vanderhoeven is from Belgium, hence a flare of European touch & influence on the menu, which offers tasteful varieties mixed with lovely local dishes. You will never go hungry and there are always delicious desserts to round things up. Falling asleep with the ocean in the background is absolutely priceless. So is waking up to it! The next morning called for a dip in the pool; so we did and it was absolutely delightful. Our stay coincided with the beginning of the short rainy season, so we had a bit of rain which made the air fresh and the aroma of flowers and nature was intoxicating. One simply feels like doing nothing, and that is what we mostly did. At some point we decided to go for a walk and wandered along the beautiful beach. It is a fascinating thing to observe the tide as it comes & goes, as it does there fairly swiftly, and if you stay still for a bit you can watch the crabs peek out of their little holes in the sand to only disappear again as soon as you move. The few days went by way too fast and it required a fair amount of will power to pack and 'face' the 'outside' world again. I can offer you the consolidation & the knowledge that you will find that this feeling of having spend an unforgettable time, the sense of peacefulness & the memories will stay with you for a very long time! – Something you wouldn’t want to miss! 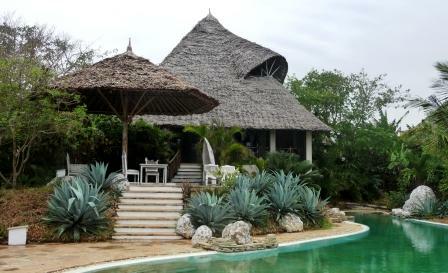 Are you interested in booking at the Msambweni Beach House? Click here for the best rates.